You have your own business, product, service, or idea, and you know that you should be promoting yourself through social media. You head to the nearest library or bookstore to get your hands on some books and start reading. The books instruct you to blog about this, tweet about that, engage with your Facebook fans, and converse with others using your LinkedIn connections. All of this is great advice, but one thing most of these social media marketing books lack is how to create and use these wonderful social media tools. Tweeting your latest blog post is a great way to point users to your blog site, but if you don’t know how to correctly setup a Twitter account, let alone tweet your post, then these books are not helping you. If anything, these books could make social media marketing intimidating and scary. The Nuts and Bolts of Social Media addresses this very issue. I walk you through how to create a Twitter account, a Facebook business/fan page, and a LinkedIn profile that will help you establish yourself as an expert and highlight your skills and achievements. Using very clear and step by step instructions with screenshots, you can easily build your presence on these top 3 social media sites. I explain what all those “other” settings are to help you better understand and control your privacy. I also provide real-life tips that have helped me build and expand my business using social media. This is not a social media marketing book and I am not a social media marketing expert; but I am an IT professional, and I meet people everyday who want to use social media, but need assistance in setting up the various profiles. I have had so much demand for this that I’ve developed a seminar series on how to setup and use social media. 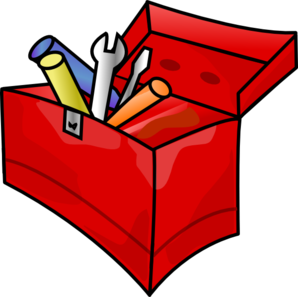 I believe social media is only one tool in your marketing toolbox, but it is quickly becoming the most effective one. I will help you lay down the solid social media foundation to build your social media marketing platform on. As we all know, building anything on a shaky foundation will eventually lead to failure. Take advantage of social media marketing to boost your business. It’s free, easy, and fun. The Nuts and Bolts of Social Media will help you lay down a solid foundation to build your social media platform on, and help build your business from the ground up. PS You can download a free Kindle version of the book from Amazon from July 8-9th. If you do take advantage of this offer and like the book please leave a review. This week, my “darling children” (Jamie 14, and Aedan 12) convinced me to use my virgin YouTube channel. I can honestly say that anything related to video-production scares me. (Not quite as much as improper server setups, but close; see article IT How Pennywise Would Have Done IT for some scary IT). I prefer the written word, but I do understand that not everybody likes to read, and video can be easier to learn from. Yesterday afternoon, my darling children and I sat down at the kitchen table and brainstormed ideas, wrote a script, and proceeded to record. In the past, I have struggled with video. I have had experience with being filmed, and it has never went without a hitch. The moment I look at the camera, I panic. End of story. It doesn’t matter if it’s video or still, it makes me squirm, and there are many pictures of me with some weird smile on my face. I don’t have the same problem when giving a presentation or teaching a class, until I notice a camera is capturing every word I say. I can be speaking very confidently, but the moment I see a video camera, I stumble. It would be much easier to avoid this altogether, but if I do that, then all I’m teaching my children is to hide from what scares them. I’m always telling my kids to live outside the box, and yet when they suggest something outside of my box, I try to crawl back into my pre-established comfort zone. After working up enough courage to set up my phone (yes, I only used my S3), review the script, and try to find a way to keep the phone propped up, I took a deep breath, and started talking to my phone. My first couple of tries were horrible and frustrating. The language I was spewing would have resembled that of a Green Day concert (that I took my darling children to at ages 8 and 10). I hated every moment of it, from the hair in my eyes, to looking at my script, to squirming in my chair. But the kids kept encouraging me and told me that I couldn’t quit because I was uncomfortable, and that that would be going back into the box, where it’s safe. After a few more tries, we ended up with something I could work with. Next came editing. I thought doing the recording was scary, but editing is a nightmare. My software kept crashing and wouldn’t save my edits. It was slow and I had to really get a feel where to splice the sequence (except for the part where I accidently left the “1, 2, 3, go” in). I am fairly happy with my final product, considering I had no idea what I was doing. Some of the outtakes are hilarious. Next, I was ready to upload the video to YouTube. Again, the kids came to my rescue. “Mom you need to add a description. Mom you need to edit your profile. Mom you need to name your channel.” This quick little video was rapidly becoming a lot of work. Finally, I was uploading the final product. My kids couldn’t wait to view and critique it. Once it was up, they quickly loaded it and then started laughing hysterically. My heart dropped. What could be so funny about my video? It looked OK on my computer, was there food on my face, boogers hanging out my nose, maybe a funky hair thing? None of the above. 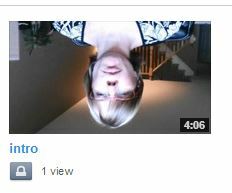 My video was upside down! My first attempt did not go as planned, considering I pride myself on being the “infamous Guelph computer geeky girl”. I suspect this happened during a modification I made to the software to prevent the crashing issue. At least that’s my story. I hope my first video – my introduction video – will be the wonkiest. Moving forward, my videos will be about topics I know, understand and speak about all the time. I am hoping my natural speaking ability will come through and I’ll get more comfortable with the camera itself. I have come to realize you can’t always do what you are comfortable with; you’ll never grow and learn new things if you don’t try anything new, as scary as it may be. Life’s too short to be stuck in the box. If you wish to see my right-side-up video, click here.